I usually make homemade crepe-style manicotti for the holidays, but it’s pretty time consuming so I save it for special occasions! This easy, streamlined version is made with manicotti pasta, which you don’t even have to boil, and jarred Pomodoro Fresco Sauce from Delallo, my favorite and the only brand I would use if I am not making my sauce from scratch! Serve this with a salad or vegetable on the side. Swap the beef for turkey and chicken sausage. Leave the meat out and use vegetables. I love using chopped spinach or sauteed mushrooms. Swap the parsley for other fresh herbs such as basil. 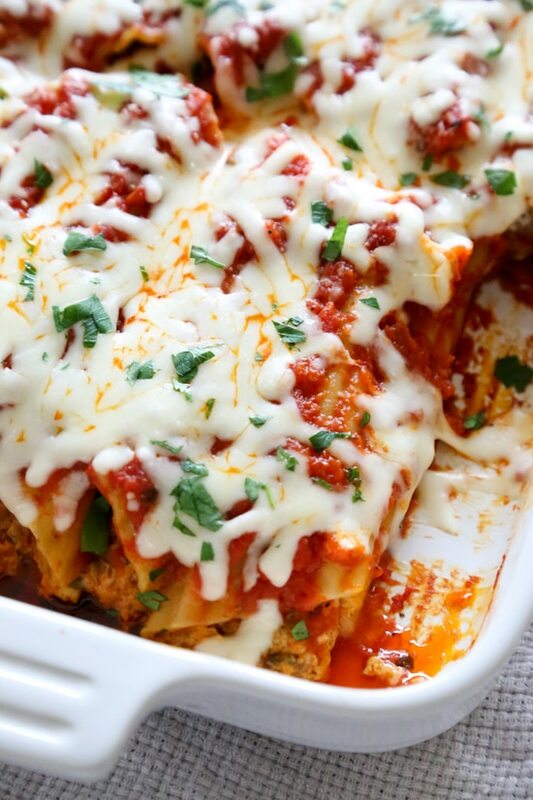 Stuffing cooked manicotti shells is a challenge, so using uncooked shells is preferred and saves you the extra step. The tip to making sure the pasta cooks in the oven in using enough sauce to completely cover the shells and covering the casserole dish tight with foil. You can prep this dish the night before, to do so stuff the manicotti shells, transfer to the baking dish, cover with sauce then tightly cover with foil. Refrigerate then pop it on the oven when you are ready to bake. For leftovers, transfer individual portions of cooled manicotti to freezer containers; freeze. To use, partially thaw in refrigerator overnight. Transfer to a microwave-safe dish and microwave on high, or reheat in the oven. Heat a heavy medium skillet over high heat. Add the ground beef, season with salt and pepper. Saute until the meat browns, drain then add the onion and garlic, cook until translucent, about 5 minutes. Remove from the heat, and cool. 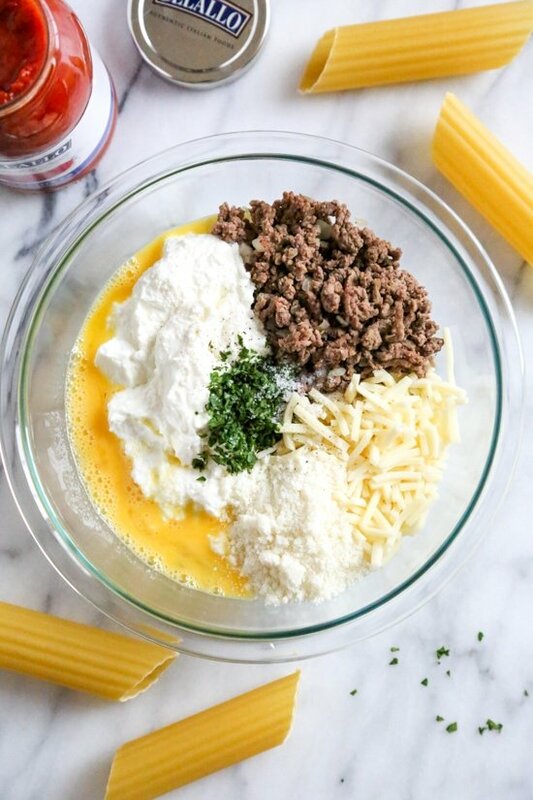 In a medium bowl, combine the ricotta cheese, cooled ground beef, parsley, 1 cup mozzarella cheese, Parmesan cheese, egg, salt and black pepper. 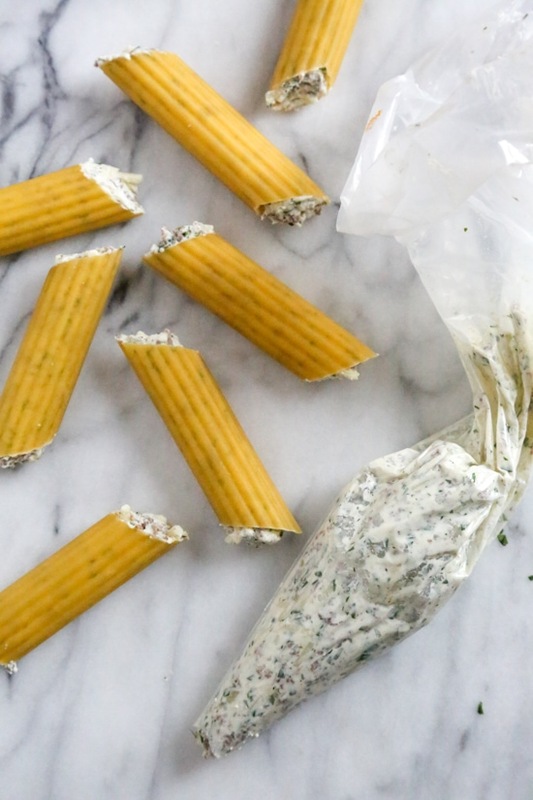 Transfer the a piping bag or gallon size ziplock bag, with a 1/2 inch hole snipped off the corner and stuff each uncooked manicotti shell with about generous 1/4 cup each. Spread 1 cup of the sauce mixture into a greased 13×9-in. baking dish. 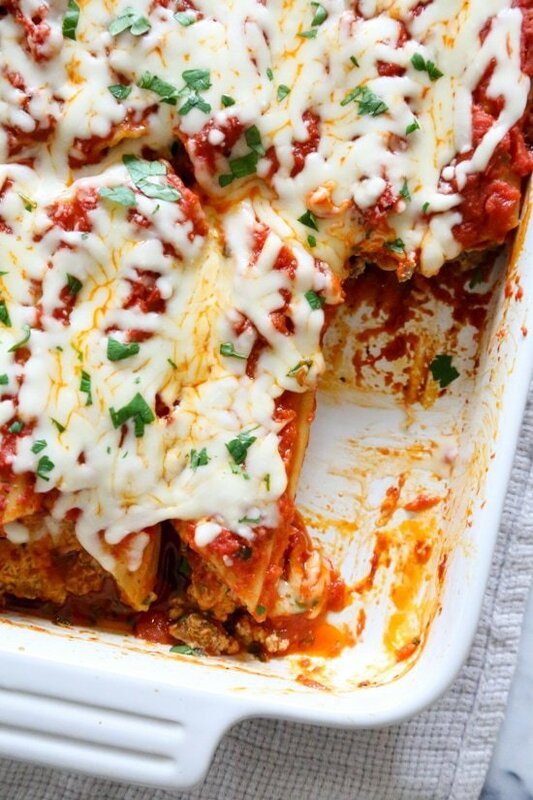 Arrange stuffed manicotti shells in a single layer over sauce. Top with remaining sauce. Cover tight with foil and bake at 375F until pasta is tender, 60 to 65 minutes, until the pasta is tender and cooked. Uncover; sprinkle with remaining cheese and bake covered 3 minutes longer or until cheese is melted. Disclosure: This post is sponsored by DeLallo. I only share products I use in my own kitchen. What is the serving size foe 10 points? 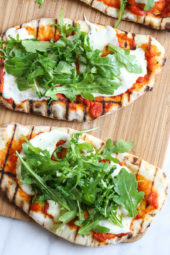 What can I substitute for the Delallo pomodoro fresco sauce? I can’t find it anywhere! I LOVE every recipe I get off your site and in your cookbooks! Love them all!!! Quick question this recipe. How do I make this ahead and place in the freezer. Should I follow the “How to freeze leftovers” or follow “How to make ahead” and then freeze it? I want to make for a friend who is having a baby but want to give her the option when to eat it. Has anyone frozen this dish? Im wondering if I should omit the sauce covering the manicotti before freezing? Great dish to make for friends, but I want them to be able to keep it frozen. If you were to sub spinach in for the beef, what kind and how much would you use? I made this last night, and it was amazing! My sister in law is very pregnant so I thought it would be nice to make for her, but they’re headed to the hospital and I have it ready to bake! Can I freeze the whole pan so it’s ready for when they bring home the baby?Thanks! Did you end up freezing this? I’m going to try it, wonder how it’ll work out? I made this with hot italian sausage and used shells. It was soooo good! I boiled the shells first and was able to cut the bake time down to about 30 min. So yummy! I am making this right now! I added a little spinach and used ground chicken. I also made your Chic Pea Tomato soup and Crockpot Santa Fe chicken today!Love your recipes Gina! Delicious. No complaints from family. There was no mention of diet or healthy! What a treat!! I love that I can enjoy such a decadent dinner without blowing my daily points out of the water. And it’s relatively easy to prepare as well. I did have some filling left after packing it into the shells. I just squeezed it in and around the stuffed shells in the baking dish, then covered all with sauce. The pasta was cooked perfectly…going the full 65 minutes. Already looking forward to leftovers later in the week! 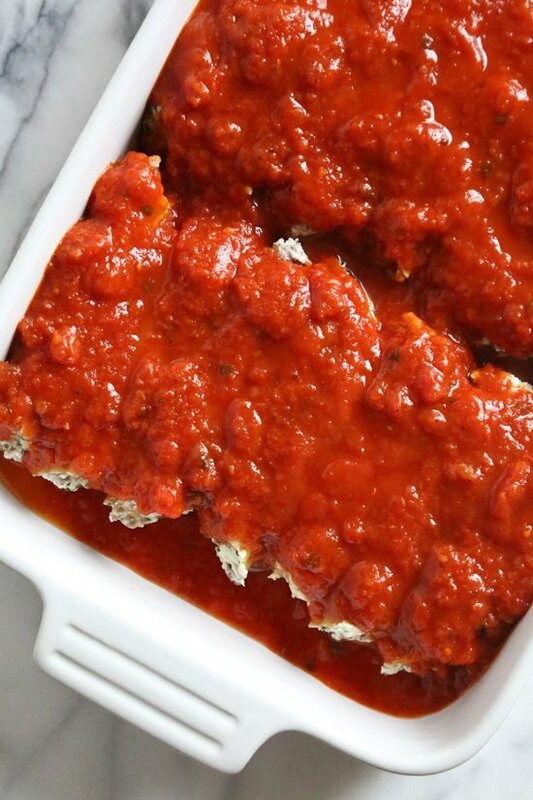 I used your spinach manicotti recipe filling, piped it into uncooked manicotti shells, covered it with a can of good crushed tomatoes, baked it per this recipe and it was out of this world! What an exciting discovery that shells don’t have to be cooked!! This is sooo good. For some reason, my large supermarket does not have much selection as far as ricotta, so I subbed in reduced fat cream cheese. My pastry bag was too small so I used a small cocktail spoon to fill the shells, which worked fine. I made this, planning to use it for lunches this week, but my partner flipped out over it. So I said we could save it for Christmas dinner as I have other things on hand I can eat for lunch. We did do a tasting of it and the flavors are divine! This may become a holiday tradition! So good! For some reason, my very large grocery doesn’t carry much ricotta, so I subbed reduced fat cream cheese. I also had leftover filling, so I mixed it with one cup of the sauce and poured it over the pasta. I then poured the plain marinara over that. My pastry bag was too small so I used a small cocktail spoon for stuffing the shells and it worked out just fine. I made this today, planning to use it for my lunches, but my partner flipped out over it, so I said we could have it for Christmas dinner if he wanted as I have other things I can eat for lunch. So it’s going into the fridge until Christmas day. Can’t wait, we sampled some and it is super tasty! Thank you for this recipe! 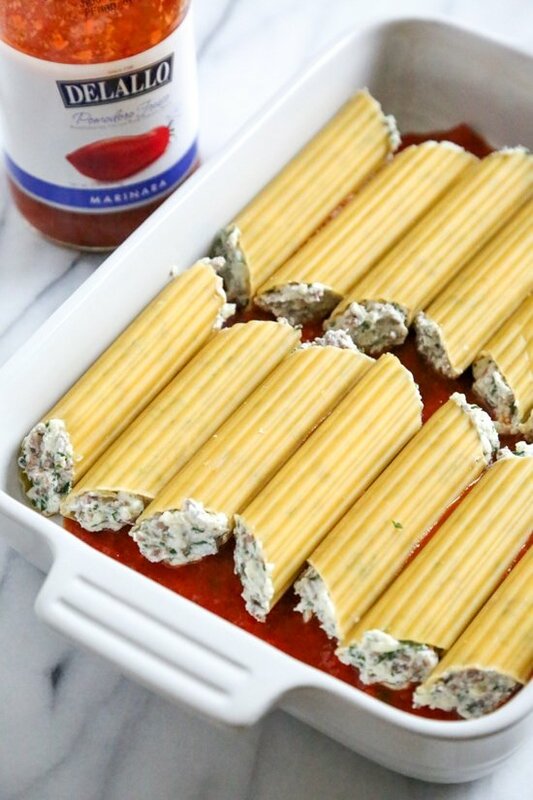 I have always wanted to try manicotti but the stuffing the shells has always intimidated me. This recipe was great! I will try your recipe for spaghetti sauce next time as we didn’t have the recommended one at our grocery so I picked something on the fly and it wasn’t a great choice. It was all very good but the sauce was a little thick so the shells didn’t cook as soft as I had hoped. But overall super impressed and will definitely be giving manicotti again in the future. Thank you! This might sound stupid, but can I just use regular manicotti noodles or do I need to find oven ready that do not require boiling first? I made this tonight and used regular. Turned out great! I also make lasagna without boiling the noodles and I just use regular noodles. Just make sure the sauce covers the noodles and they get cooked as the dish cooks. Made this tonight. Used ground turkey and added about a 1/4 cup chopped fresh spinach with the parsley I really was surprised at how easy this was to assemble and that it turned out so well using the dried pasta. I had the right amount of the mixture nothing leftover. I think you just need to make sure you get the whole cannelloni stuffed from both sides I put my hand over the end as I was pipping the stuffing. I can’t wait to try it with roasted veggies. Now next up will be the snowman cupcakes! Gotta have those, it’s the holidays! this was SO good, and SO simple! I was a little intimidated, but it was perfect! will definitely add into my normal rotation! Is the cooking time different if you do vegetables rather than meat? Or same? Made this last night with homemade ricotta and everyone enjoyed it! I agree with a previous poster that 15 minutes prep time is not realistic. I think it was 15 minutes just cooking & mixing the filling. I also had extra filling (as I used a full pound of beef and thus a little extra ricotta), so I just threw it in a ramekin and set it next to the shells in the baking dish and it worked fine. Thank you for the video, as never having made stuffed shells before, it gave me a boost of confidence to try something new. Merry Christmas! I absolutely loved how Simple and delicious this recipe was! Will definitely be making it again for my family. I added spinach too which made it extra yummy. These look so yummy!! My kids have an egg allergy…. 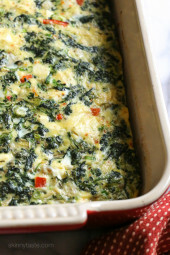 have you ever used anything instead of egg in a dish like this? I am sure you can leave the egg out and still be ok. This was so so so so good. My husband complimented it a million times. Delicious! A must try!! Hi Gina, This was a hit at my house! I’m sure I will be asked to make this again and again…. I have made this before in a crock pot but it’s so hard to get the manicotti out in one piece. I’ve always wondered how it would turn out in the oven so thank you for posting this recipe. Regards. I made these for dinner last night. I used a full pound of ground turkey so I ended up with extras, which is no problem. I plan on freezing the leftovers anyways. Thanks for another great dish Gina!!! Would it be less points if it were made with your Crespelle recipe? I’ve gotten pretty good at making them and don’t mind the extra work! Pretty close I am sure. Holy cow! This was SO good— I have never done any kind of stuffed pasta and this recipe was a great foray into the world of “stuffed pasta.” It was technically very simple and requires minimal ingredients and clean-up! And it tasted so decadent and delicious! I like reviews that are helpful and informative, so here’s just a couple of quick notes from my experience:(1) when I first saw that the serving-size was only two manicotti pieces, I was nervous that this recipe was too good to be true in terms of nutrition facts— but honestly, 2 pieces were more than enough— I didn’t even need to have a side dish! This is a filling meal that will make great leftovers! (2) I used a full pound of 96% lean ground beef. I know that the recipe only calls for 3/4 lb but I hate just having a random quarter-pound of beef lying around afterwards. Also, I am just recently starting to get comfortable with ricotta so I chose to use more ground beef and less ricotta— it still turned out great. Also, for those of you saying that you had leftover filling: just plop the leftover filling on top of the whole dish! That way you aren’t wasting any product! (3) thanks to the poster who said she just used a spoon to fill the pasta. I was almost too intimidated to try this recipe because I didn’t think I was coordinated enough to try a piping bag, but using a small spoon to fill each side of the pasta a little at a time and pushing in through to the center worked great for me. (4) 15-minutes for the “prep” of this recipe might be on the conservative side. Prepping alone took me close to an hour— but then again, I’m not a very advanced cook. Just want to alert other remedial cooks that this isn’t the kind of dish that you can have on the table by 6:15pm if you get off work at 5:00. :)All-in-all I think this recipe is a keeper. I have been looking at it and wanting to try it ever since you posted it (which is big for me because, again, I am not the biggest “ricotta” person yet). I’m so glad I tried this. It’s so yummy and looks so impressive— I hope I have a chance to serve it to friends or family over the holidays! The entire family loved this dinner! I absolutely love how you can bake it without boiling the noodles! It’s on the rotation list for sure. I will point out … 🙂 I love these type of recipes, they’re REAL… I have recently have felt the blog has fallen into the cauliflower rice, and other substitutes genre (I’m an fitness instructor/anti-diet advocate, so sometimes when I see those swaps I want to tell the world it really is OK to eat rice & potatoes!! lol)… but what I’ve loved most about this page the last 6 (?) years is how you can make something so hearty and real, lightened up to where I FEEL great after eating them. 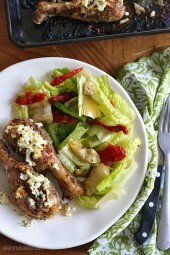 Thanks for another great meal – you’re my favorite blogger with the best recipes. This was tonight’s dinner and very good. I think it will make great leftovers too. It was easy to assemble. I made this tonight and it was amazing. Thank you so much for this recipe! I think I’ll be making this a lot for the holidays. Super easy. Thanks for the great recipe! We tried making it last weekend, it didn’t look as good as yours, but the taste was out of this world. All the ingredients are perfectly combined and they create a real heavenly taste. I’ve tried a few of your other recipes too, they are just as good as this one. YUMMY! I made fresh pasta, and omitted the meat, substituting fresh chopped spinach. It was delicious! This will certainly be making a reappearance at meals soon! I made extra manicotti, and froze them, so it will be soon! I made these tonight, and my five year old and 11 month old loved them, as did my husband and me. I added pesto into the manicotti and on top with the cheese. I found them a little hard to fill with the bag, so I used a little spoon. I was skeptical about the raw pasta cooking, but it was perfect! I am excited to make this recipe tonight. However, when I entered this into my WW recipe creator this came up as 16 Freestyle points. I am wondering how the calculations have been created. I am still going to make this, but am sad at the HUGE difference in points from this to that. I always calculate with my homemade marinara because if you plug in the numbers, it will add points for the 0 point canned tomatoes, that could be the discrepancy. I made this last night and it was loved by everyone. I accidentally used a full pound of ground beef, but it was fine. To cut down on baking time I boiled the manicotti for about 4 minutes before stuffing them and it was easy peasy. In the future I think I would only use one jar of Dellano’s sauce (it’s pricey), and it was more than enough sauce. Thanks for the great new pasta recipe! Great Mel! Since you pre-cooked them, 1 jar is perfect. Hi Mel – how much did it cut down the baking time since you boiled the manicotti for the 4 minutes ahead of time? Thanks! I made this last night. Turned out well overall but I had a lot of extra filling. Perhaps they didn’t get filled all the way in the center? We had this for dinner tonight! It was very easy and husband approved! 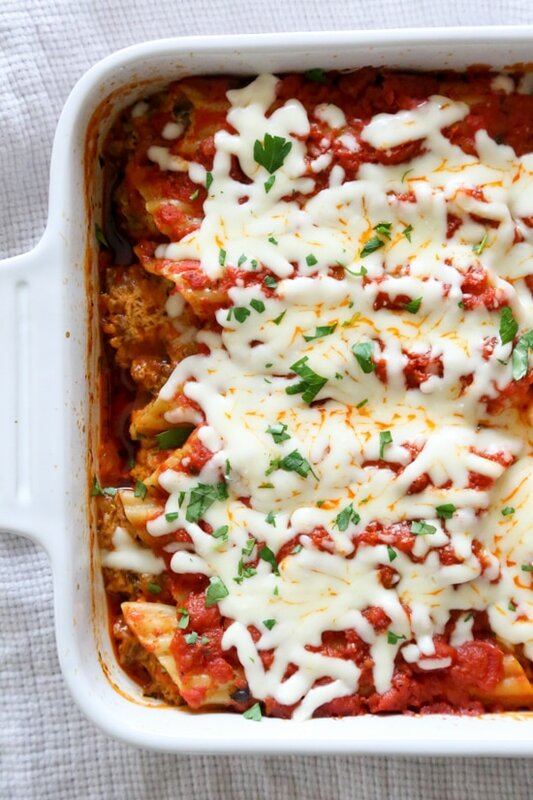 Think you could just add meat to the sauce and use the cheese mixture for the shells? My boyfriend would complain there isn’t enough meat in this. I would probably add mushrooms too! This is how we always make manicotti and shells. It still tastes great! If we don’t want to use ricotta, what would be a good option? Maybe more beef? Don’t know if this would still be too similar or you’re dairy free, but my mom doesn’t like ricotta so she subs cottage cheese. I use plain Greek yogurt in the place of ricotta. I love manicotti! Thank you for this recipe. Do you think it would change the calories much if I used your quick marinara recipe instead of the one suggested? My family gets upset if I cook with a sauce other than yours. It will be very close! Oooh this looks amazing! I might have to go do a market run today to try and make this recipe for dinner tonight. Thanks for the idea!